The Xiaomi Mi 9 was released just a week ago in China, right before MWC. It’s one of the first devices coming with the 7-nanometer Qualcomm Snapdragon 855, at least 6GB of RAM, 128GB UFS 2.1 internal storage, a 3,300 mAh battery, a 6.39-inch FHD+ OLED display, in-display fingerprint scanner, and Android 9 Pie-based MIUI 10.2. At its price, this phone is an early contender for best phone of H1 2019. During MWC, Xiaomi also announced the Mi 9 for Europe starting at 449 Euros. During the short timespan between announcing the device and today, Xiaomi managed already release the first software update. As you probably already know, the Xiaomi Mi 9 has a U-shaped notch on the top of the display. Apparently, some users on Chinese forums complained about its shape. Xiaomi has heard the complaints and released a software update to fix this “issue,” which honestly sounds really silly, by adding a notch overlay that the users can apply in the settings. You can see a comparison between the notch of the Mi 9 after the new notch overlay has been applied and the notch on the OnePlus 6T. Left: Xiaomi Mi 9 with waterdrop notch overlay after update. Right: OnePlus 6T. 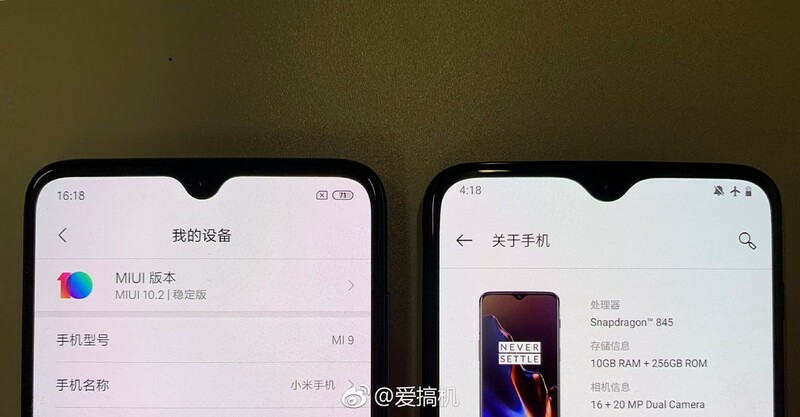 Xiaomi Mi 9’s U-shaped notch. Source: PocketNow’s hands-on of the Mi 9. The changelog of the update also mentions optimizations to the camera quality and the addition of some AI modes, as well as a shoot-on-motion feature while recording video. The changelog is in Chinese, so that’s as much as we get from it. XDA Recognized Developer yshalsager already shared the download link of the update. It is branded as version 10.2.11.0 and is 2.4GB in size. Please keep in mind that this is the MIUI China version, meaning that it doesn’t come with Google Play Services and many language options. The buyers of the European model of the smartphone, therefore users of MIUI Global 10.2, may have to wait a little longer.